Have you ever thought about whether social media plays a part in your wellbeing? Or, more specifically, whether it impacts your mental health? Social media can be really positive. It can be a great way to communicate and to maintain friendships. It gives us lots of opportunities to connect with like-minded people, organizations, and groups, and it can make it easier to access services like mental health supports too. Studying the effects of social media is still relatively new and so far the results have been mixed. 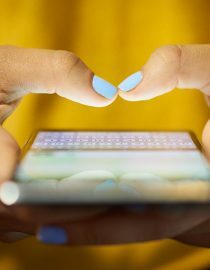 But according to the Royal Society for Public Health in the UK, social media can be linked to increased rates of anxiety, depression and poor sleep. As with any aspect of mental health, it’s important to be honest with yourself and check in on how you’re going. Ask yourself, how do I feel after spending time on social media? Do you feel better? Energised? Connected? Or are you left feeling deflated or overwhelmed? Distracted and frustrated? Answering this honestly, and thinking about how often you feel better and how often you don’t, is a good place to start. It’s well documented that social media can lead to a ‘compare and despair’ situation, with other people’s images leading to feelings of inadequacy and frustration. This happens because it’s tempting to compare yourself and your reality with what you see online. Everything you’re seeing online is curated. It’s all chosen by people, by companies, by groups – it’s all put forward to contribute to the way they want to be seen. Even when it’s self-deprecating or modest, it still needs to be recognized as a chosen representation. If your friends are posting amazing holidays or picture-perfect houses, they’re probably not showing you the disagreements at the airport or the five baskets full of dirty washing. That doesn’t make them bad people: it just means that comparing their curated pictures to reality is like comparing apples and oranges. So remember, what people post only tells us how they want to be seen, not the reality of their lives. Comparisons between their online and your offline can be meaningless, and that’s an important thing to remember. Do you fall into the trap of scrolling on your phone at night? A study of teenagers in Scotland noted that night-time specific social media use predicted poorer sleep quality. We know how important sleep is (and there’s lots of evidence suggesting you should avoid screens before you plan to sleep) so it’s probably a good idea to switch off and have some social media-free time before bed. 4. How Much Time Do You Want to Spend on Social Media? A recent study called #statusofmind (run by the Royal Society for Public Health in the UK) concluded that young people who spend more than two hours per day on social networking sites are more likely to suffer from increased levels of psychological distress, depression, and anxiety. So, as with anything, balance is important. Don’t let social media take up more time that it’s worth. And don’t let it creep into the time you normally spend on other things that are important for your wellbeing, like your exercise time, your sleep time, your relaxation time and your screen-free time. 5. Do the Actual Platforms Make a Difference? The #statusofmind study asked participants to rank which platforms they thought had the most impact on their mental health. The results placed Instagram as the most negative, followed by Snapchat, then Facebook. Early studies from the US also indicate correlations between the number of platforms people are using and their mental health. A comparison of those who use fewer platforms (0-2) with those who use more (7-11) shows those using a higher number have substantially higher odds of having increased levels of both depression and anxiety symptoms. So think about which platforms you find the most positive and rewarding, and which platforms you might want to take a step back from. Social media has many benefits, and these preliminary studies don’t necessarily mean that it’s all bad. There are clear positives too. But it might be worth taking the time to reflect on how you use social media. Do you feel positive about it? Or do you feel weighed down by having to check 10 different platforms morning, noon and night? Whatever your situation, if you’re not feeling great about your own mental health, checking in with your doctor is a really good idea. They’ll be able to talk with you about the kinds of things you’re experiencing, and the many things, like coping techniques, that can help you on the road to recovery. Terri Bowman is the creator and CEO of Brain Wellness Spa™. For almost a decade Terri has been successfully working to help people overcome a myriad of mental illness and emotional problems and her results are an absolute revelation. Terri doesn’t believe clients need to pay for expensive therapy to get the help they need, which is why she has set up her unique stress treatment centre in Perth. Her mental and emotional help methods give you the ability to handle your issues in a way that suits your specific needs. She is here to offer treatment that is original and successful, giving you the relief you so highly-sought after. With a few lifestyle changes you can increase your confidence and learn how to boost your self esteem.